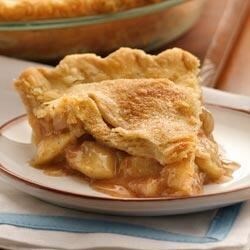 "A classic apple pie takes a shortcut with easy Pillsbury® unroll-fill refrigerated pie crust." Heat oven to 425 degrees F. Place 1 pie crust in ungreased 9-inch glass pie plate. Press firmly against side and bottom. being from new england, we are fussy about our apple pies. now is the season for picking and let me tell you..this is the one!! loved it!! This really is The Perfect Pie! !